Overview of Royale Beauty Products* | Vanity and Everything in Between. Lots of beauty products to choose from! 3. 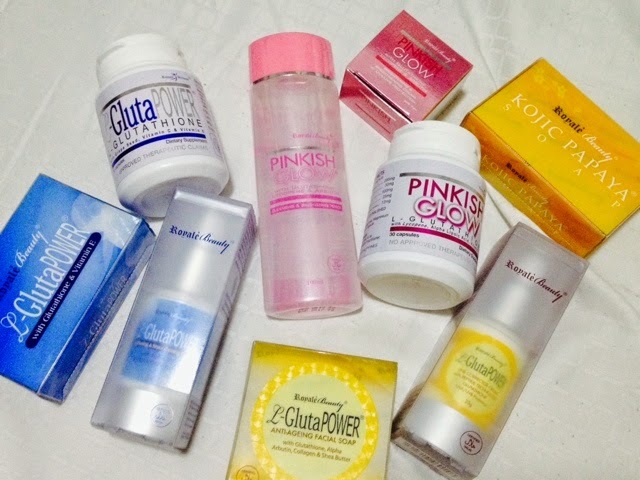 Pinkish Glow Glutathione Capsule, PhP1400.00, a premium formulation of L-glutathione with lycopene, vitamin E/ocopherol, and vitamin C.
4. L-GlutaPower Lightening & Smoothening Cream, PhP530.00, offers all round defenses against factors that cause dark spot and uneven skin tone and works not only to lighten the skin but also helps it become healthier. 5. L-GlutaPower bar soap, PhP198.00, helps remove dark spots, reduce freckles, age spots, and pimple marks, whitens, revives, and nourishes skin to make it look radiant and flawless. 6. 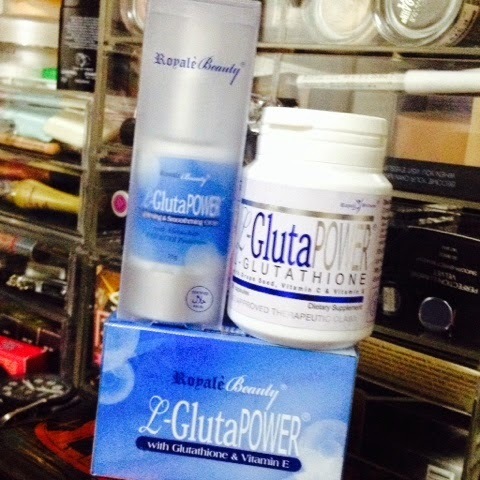 L-GlutaPower Glutathione, PhP1680.00, has 30 capsules per bottle. It's made from 3 amino acids: cysteine, glutamine, and glycol which are very critical for detoxification and serves powerful antioxidants. 7. L-GlutaPower line corrector cream, PhP560.00, has nectapure which is a special extract of delicate plant from the Alps combined with the Swiss Mountain Water to provide protection from photo-ageing and SYN-COLL, that boosts collagen synthesis via tissue growth factor. It is anti oxidativem radical protecting, has anti-pollution treatment, moisturizing, soothing, and healing, anti-microbial and anti-ageing. 8. L-GlutaPower Anti-Ageing Facial Soap, PhP210.00, is a premium facial soap that helps fight the signs of ageing such as lines and wrinkles, uneven skin texture, age spots and blotches, visible pores, uneven skin tone, dull skin and increased dryness. 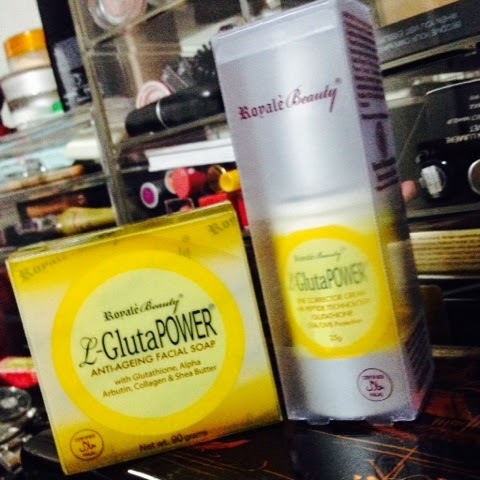 If you want to try Royal Beauty products, you may directly contact 0939-9314093 and/or 0998-5576485. They ship anywhere in the Philippines (shipping fee to be shouldered by the buyer). Or if you're shy to text them, let me know then I'll be the one to inform them. * I am not affiliated with Royal Beauty. Product was sent for editorial purposes. I was not compensated for this post nor will I ever get incentive/commission for sales/referrals generated by this post. Thoughts on this product are my own and not affected by PR sample. my "kumare" is a Royal distributor too and I only have tried their deo and kojic soap. The products surely works and very affordable. Did you try any of the products posted here? 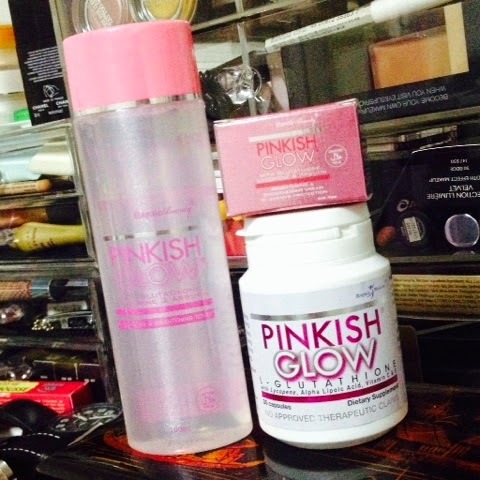 Wooh :D Please post a review on their Pinkish Glow Set.